What represents an exquisite restaurant? Besides the obligatory splendid food. The moment, when I enter a restaurant I desire to feel at ease. I do not want to fidget around on my chair uncomfortably. 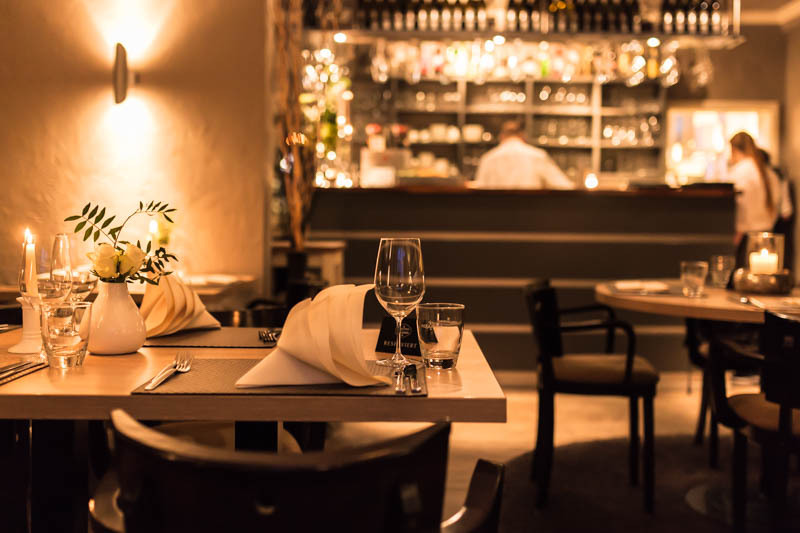 An impersonal and akward atmosphere is an absolute turn off and I am in the fortunate position to introduce the cozy, comfortable Restaurant Lenz to you. 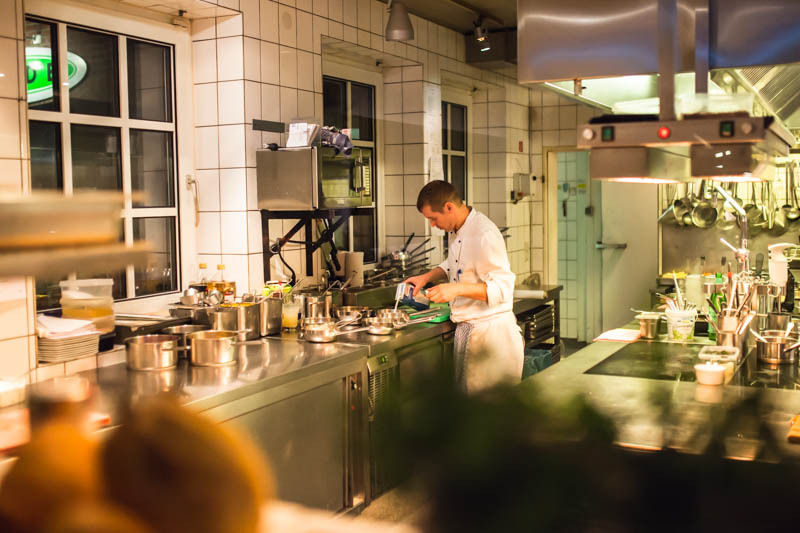 The restaurant Lenz presents itself in an unagitated, elegant suburban manner. From Hamburgs inner city you’ll reach the Lenz within about 40 minutes by car (for f**king 20 kilometres!!). The area is called Duvenstadt and almost ultimately reaches to the next province Schleswig-Holstein. You now might ask yourself the justified question which restaurant is worth this 40 minute mini roadtrip. 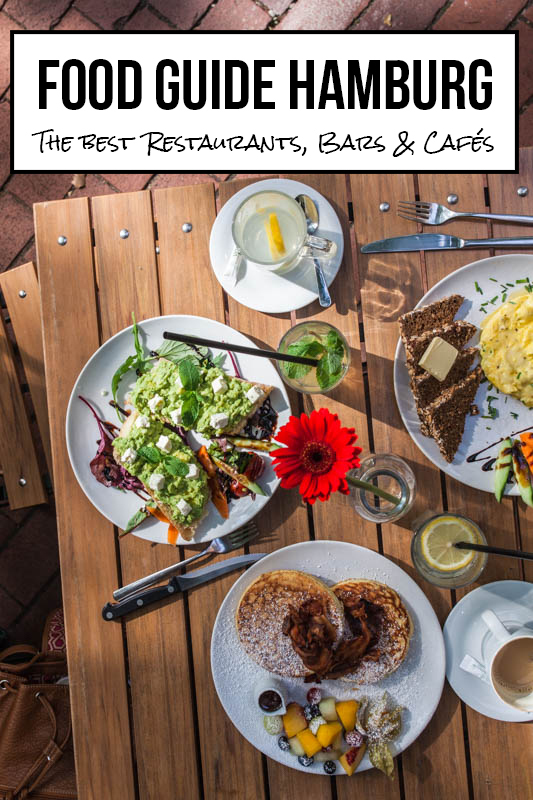 What does the Lenz have to offer? I chose to take my boyfriend with me (I mean, come on I love wine and needed a driver) to find out. The restaurant is lead by Leslie Himmelheber, which literally translates to sky lifter, how poetic! Leslie welcomed us shortly after we were greeted heartily and lead to our table. Leslie made the earliest reservation possible in order to be able to chat and show us around. So we had a little tour through the restaurant and even threw a quick glance into Dennis Kerbers (the chef’s) realm. 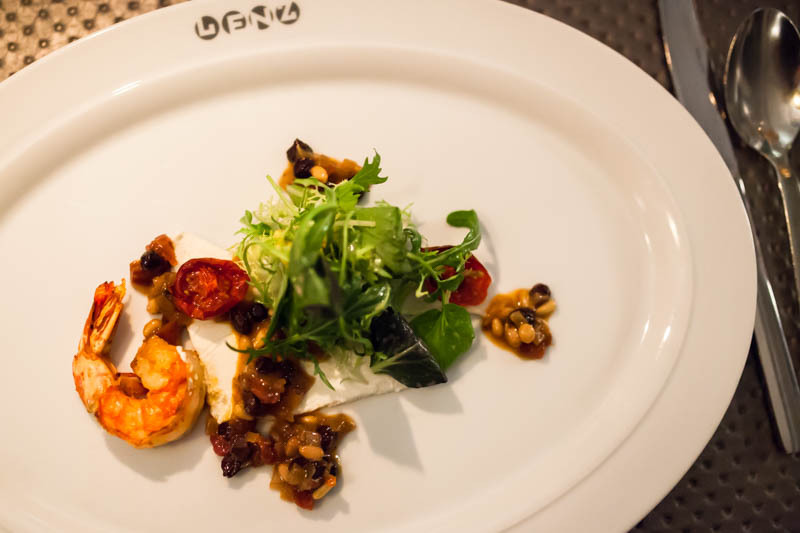 We started our culinary tour with a recommendation by Leslie, prawns with goat cheese, currants and a pine seed marinade. This dish stayed exactly the same for the last 10 years. Leslie once took it off the menu but just until several patrons complained. I can relate now as this small but nice starter was very well composed. Fruity, sweet, salty, creamy – hell yes! 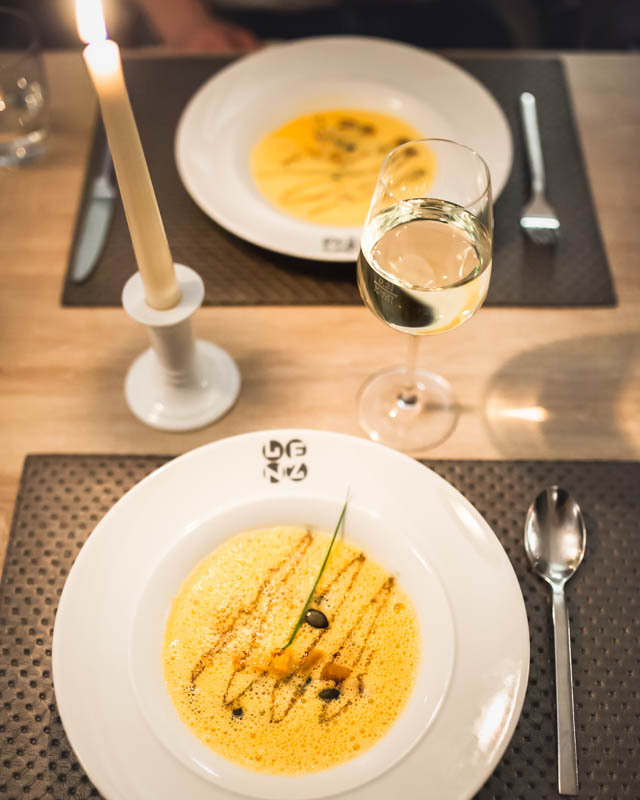 We continued – very fitting to the season – with a foamed pumpkin soup. It was fantastic! They didn’t use the ever so present hokkaido pumpkin – geez there are so many different, interesting pumpkin kinds that it’s really nice for a change to get something different. 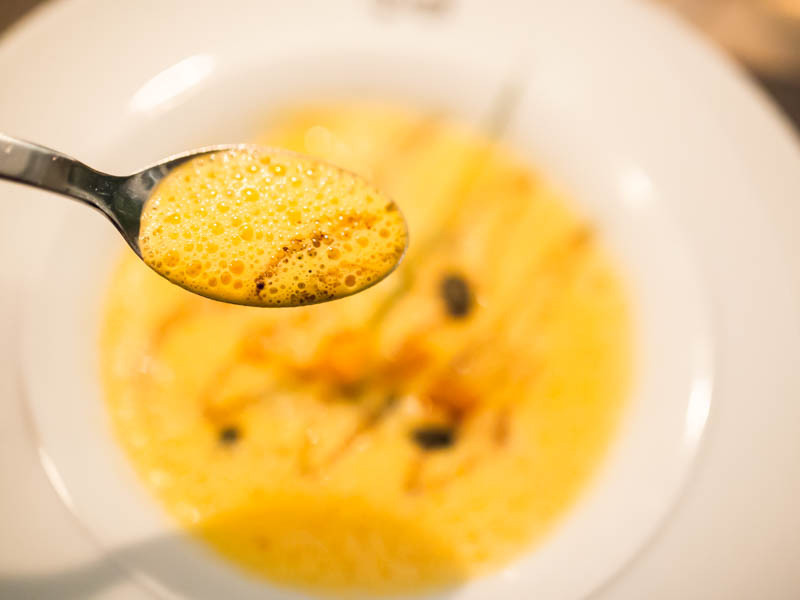 This soup was made with calabaza pumpkin which gave it a very light and refreshing taste, more fruity than creamy with little pumpkin pieces and some hints of laurel and star anise. We liked it a lot. Now followed our highlight of the evening. When we searched the menu for possible mains I didn’t have much say anymore as soon as my boyfriend Grimm discovered the duck. The die was cast. Nothing could have faltered his decision anymore. 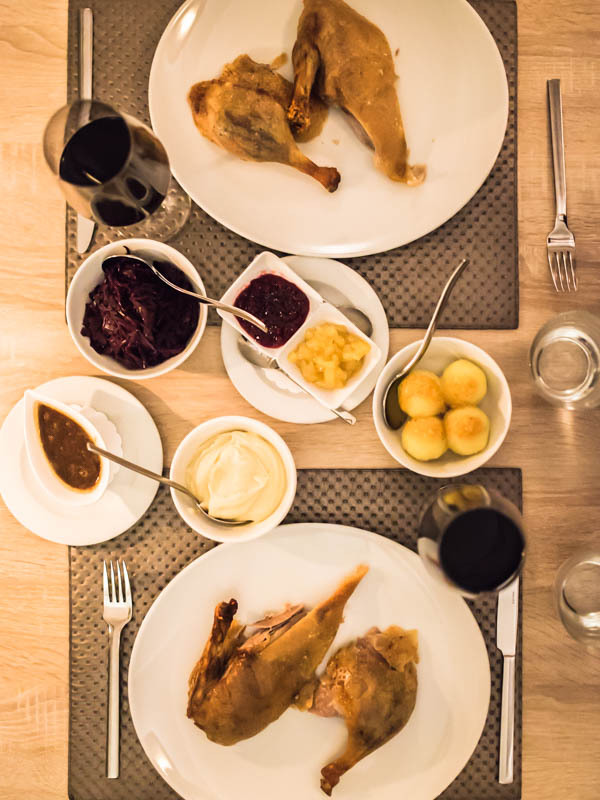 While I was on my Hamburg Restaurant tour I already came across a very splendidly prepared duck. 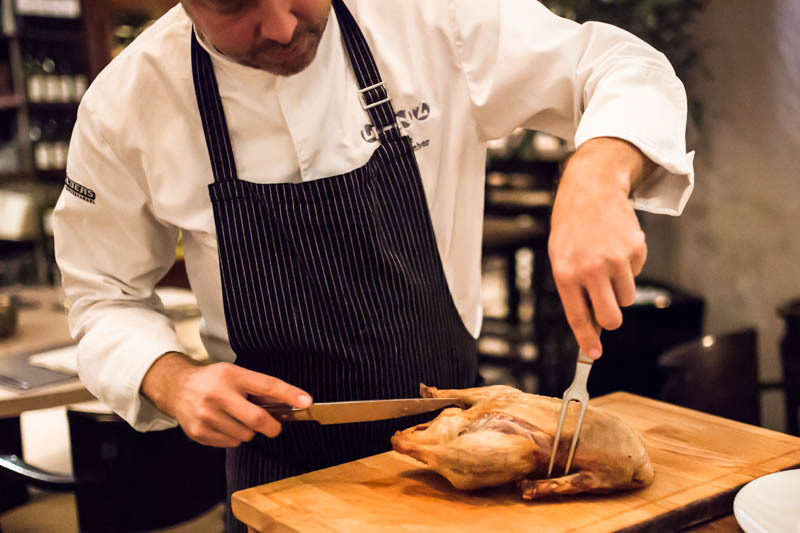 Back then at the Landhaus Scherrer we were presented with an amazing ‘Vierländer’ duck which was expertly prepared. 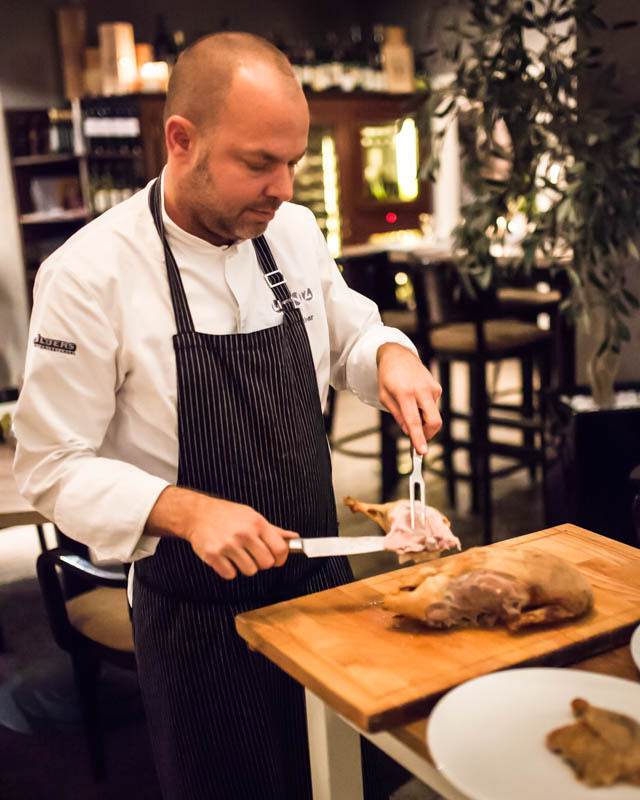 Anyway, the fact is, that both Landhaus Scherrer and Restaurant Lenz receive their ducks from the same poultry farm. Both their ducks live a stress free, happy life – at least until their organic meat lands in the oven. Which duck was the best? I’d say you’ll find out for yourself. The Lenz-ian duck is super crisp on the outside and beautifully tender on the inside. No irritating fat or chewiness. Not. At. All. The sides were equally tasty and plentiful. Leslie carved the duck in front of our table, which always looks so professional and light-handed. You will only be able to order a whole duck, which is more than enough for 2 hungry people as us (or one very, very hungry boyfriend). We’re seriously considering coming back for the duck. As usual I felt a bit on the stuffed side, but (as usual) I could make some extra space for the dessert. 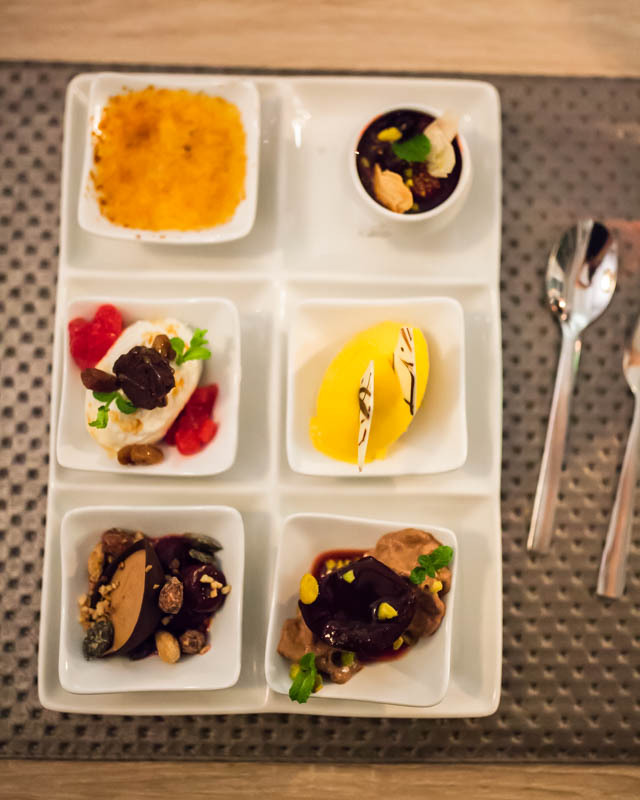 You never say no to dessert. Never! 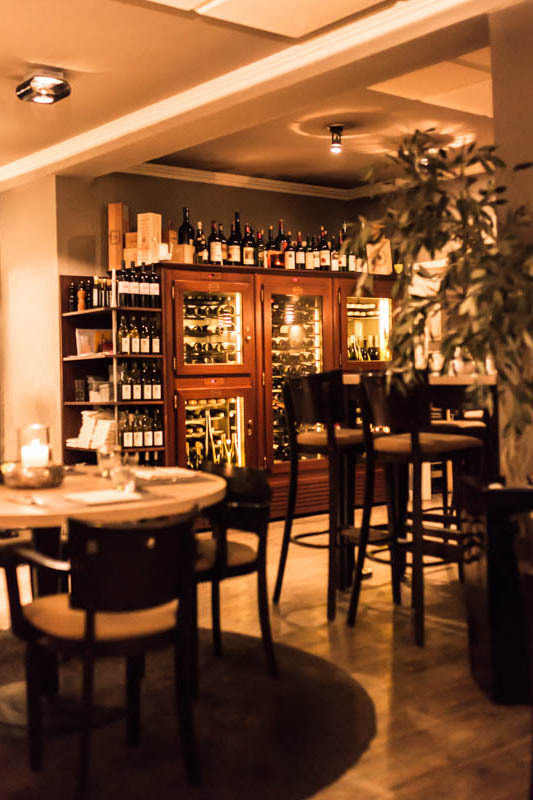 The restaurant Lenz is a familial, traditional business and you can feel that by all accounts. Starting from the heartyy welcome we were guided through the evening in a highly friendly and casual manner, without it ever feeling uncomfortable or fake. Despite the restaurant being rather big and spacious, the coziness and privacy never were disturbed. The huge room is separated into several smaller departments and the large tables had sufficiently enough space between each other. 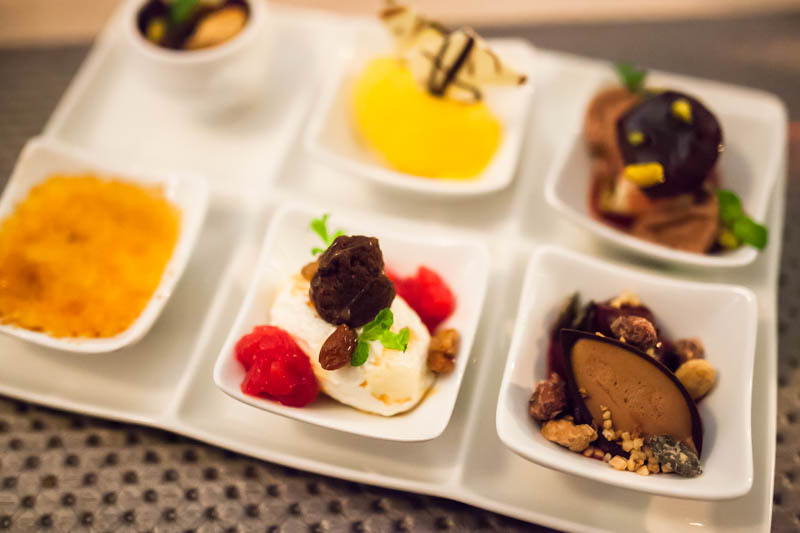 Food-wise you can expect regional cuisine at the Lenz. 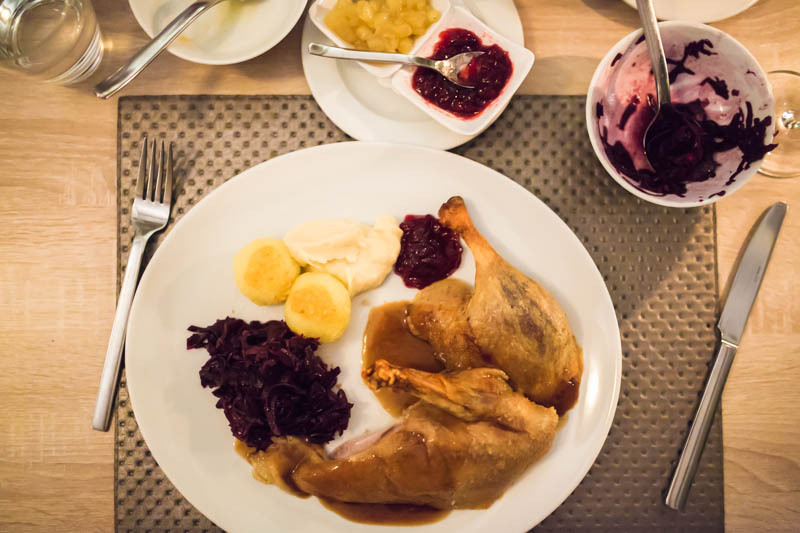 Be prepared for fantastic, traditional German food. Go on that little journey, I can tell you it’s worth it. *A big thanks to Leslie Himmelheber and the Restaurant Lenz staff for providing us with a free meal. However, this post represents my own opinion and wasn’t recompensed else wise.